Why You Should Not Invest In Cryptocurrencies? A cryptocurrency is a form of digital currency which is designed to work as a medium of exchange. It runs on Blockchain technology. Encryption techniques are used to regulate the generation of units of the digital currency and verify the transfer of funds. Cryptocurrencies are not regulated by any Government, Central Bank or Company. Bitcoin was the first Cryptocurrency. It was created in the year 2009 and is still famous. Other famous cryptocurrencies are Ethereum, Litecoin, Monero, Ripple, Dogecoin, Dash, MaidSafeCoin, Lisk and Stellar. 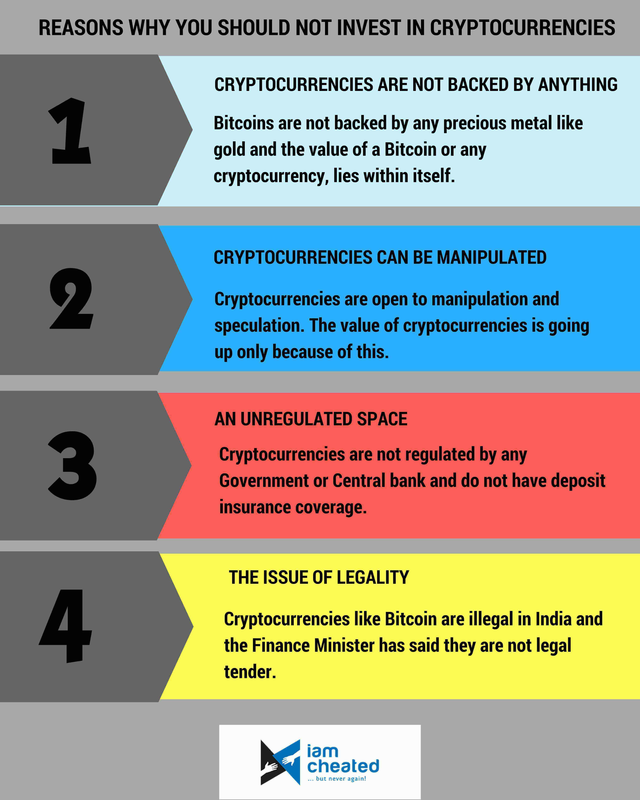 Cryptocurrencies are very volatile, as they don't have stability like the Dollar or the Rupee. Usually, Cryptocurrencies are not regulated by any Government or Central bank and do not have deposit insurance coverage. If you keep your money in a bank, whether in an FD, RD or savings bank account, the Deposit Insurance and Credit Guarantee Corporation of India, will guarantee your deposit up to Rs 1 Lakh per depositor per bank. But such guarantees are not there for Cryptocurrencies. Stocks and mutual funds are regulated by SEBI and IRDA regulates insurance. But, Cryptocurrencies do not have any regulator. If you lose your money, you can't complain to anyone. Cryptocurrencies are not backed by any precious metal like gold. Value of the Cryptocurrency lies within itself and nobody is aware of how it gets its value. Many Indians are using their credit cards to invest in cryptocurrencies. But, this is not a good idea because cryptocurrencies are not legal tender in India. If you borrow and invest, you might lose all your money and fall into the debt trap. Cryptocurrencies are open to manipulation and speculation. The value of cryptocurrencies is going up only because of this.